John B. Lindsay and Margaret Norman had five children together: Mary Margaret, the infant who died in May, 1850 in Muscatine, Iowa, John B. Lindsay Jr., Born about 1848 in Iowa, Elizabeth (Lizzie) Lindsay, Susanne Lindsay, b. Harrison County, Ohio, c. 1845., and Thomas Hamilton Lindsay B. 1842 in Harrison County, Ohio. When John B. left for Oregon, I think it is pretty safe to assume that the intention was for him to send for his family when he became established. Margaret died in the Spring of 1850, her daughter a couple of months later. This left the other four children to the care of the county. All were eventually placed in foster homes, with the exception of John B. Jr. The judge referred to him as a “sickly child” who was kept at the county orphanage. I have the original court documents on this thanks to a sharp eyed librarian at the Muscatine public Library who salvaged them for me after the county donated them to the Library for microfilming. Nice save! The court pressed John B. for money. The only record is of him sending $40 at one point. Although we assume there was correspondence with the family, none of it has survived, and as might be expected, the relatives who wound up in IL were pretty upset. At some point, John B.’s sister Susanna Lindsay Johnston retrieved the children from Iowa and took them into their home in Rockford, IL. (Hence the Illinois connection) Thomas indentured to a William Lawrence in Muscatine County until 1860 (18 years old) and was likely the last to join his siblings in Illinois. Lizzie also stayed with a family in Iowa through at least 1860, working as a seamstress. Thomas and John B. jr. worked on various farms in Ogle county South and West of Rockford near the village of Adeline. John B.Jr.’s life could be the subject of a book, but we will deal with that later. The only photo known to exist of the siblings of John B. Lindsays first family. 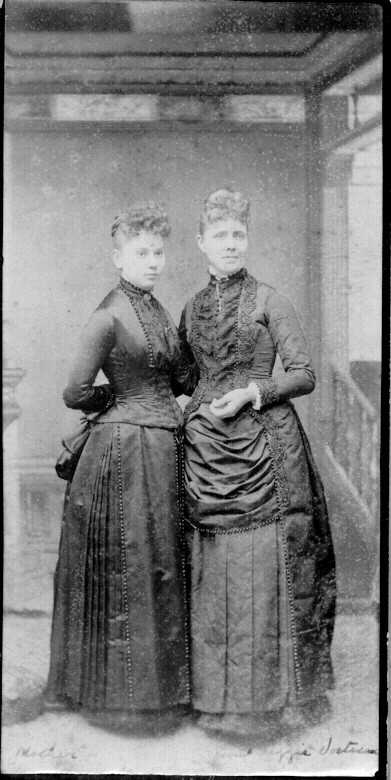 On the right is Elizabeth Lindsay Wortman (Aunt Lizzie). The woman on the right is my grandmother, Nellie Mariah Ward Lindsay. This photo is believed to have been taked about 1887. Nellie was introduce to S.J. Lindsay by Lizzie. (her nephew) They were married the following year.